Just as 9/11 is a marker for this current generation, and November 22 was for mine, Sunday December 7, 1941 was a where-were-you-when-kind of day that was seared permanently in the memory of the greatest generation, including my parents. The war was still over there, though the news was full of muffled but ominous portents. From the Far East came reports of Japanese troop movement in Indochina and that Saturday night FDR would make a last-minute appeal to the Japanese Emperor Hirohito for direct talks but to no avail. Like most Americans, my mother and her family did not expect to be at war the next day or the next week or even the next month, but they knew in their hearts it was inevitable. When, was the big question. So like everyone else, my mother’s family went about their business. The day before Pearl Harbor there were only 15 shopping days to Xmas and the department stores were having one of the biggest shopping sprees in years. Goods were plentiful but pricier than last year. Nylons were replacing silk stockings which had been scarce because of the darn embargo on Japanese silk thread. But Stern’s Department Store in NY offered them at “one special buy all you want price” of $1.75 a pair.A fifth of scotch was 3 bucks, but in two Christmases these items as well as many others would be next to impossible to find. Saturday night in NYC, where my mothers family lived, was a mass of Christmas shoppers and visitors streaming into restaurants, night clubs theaters and movies, ready to paint the town red. That evening my grandparents were Broadway-bound with tickets to see the critically acclaimed Lillian Hellman production of Watch on the Rhine at the Martin Beck Theater. It’s portrayal of a family who struggle to combat the menace of fascism in Europe during WWII responded directly to the political climate of the day, and the continuing debate on American neutrality in the War. While the audience absorbed the words of Lillian Hellman’s warning that “all who chose to ignore the international crisis were helping to perpetuate it and that no one could count himself or herself free of danger,” 6 carriers of the Pearl Harbor striking force under Vice Admiral Chuichi Nagumo sliced through the blue waves of the Pacific a few hundred miles north of Hawaii. The pictures of silvery sands mingled with war planes flying over Diamond Head. 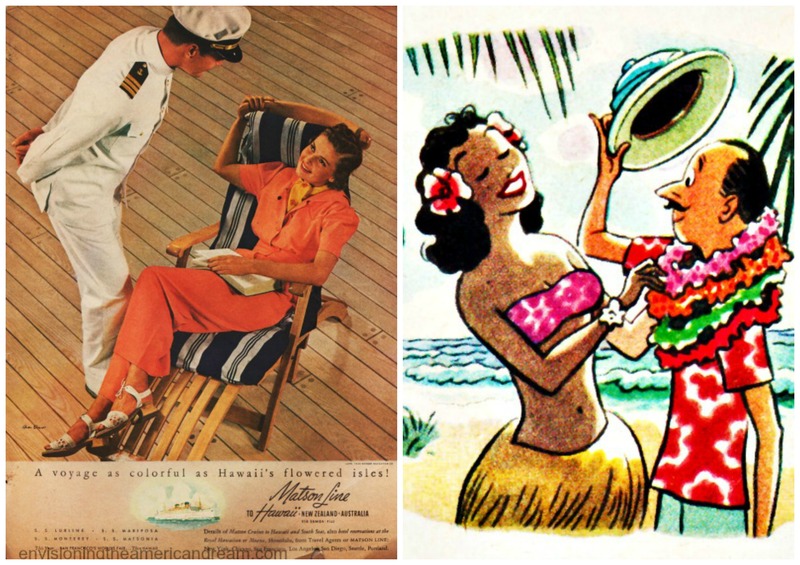 As the newspaper article pointed out, the lucky lei-draped tourist vacationing there would be too busy eyeing the hula girls to notice the Army pillboxes since they were cleverly concealed from prying eyes. The accompanying pictures showed an idyllic tropical setting, causing my grandmother to make a mental note to visit there sometime soon. It was difficult for many Americans to understand what was happening in the Pacific. We were preoccupied with Hitler. Another factor was plain and simple geography. Until the air age, islands like Midway and Iwo Jima were practically worthless. Like most Americans, most of what my parents did know about the Pacific had been invented by Hollywood. The south Seas were pictured as exotic isles where lazy winds whispered in the palm fronds and native girls wore sarongs like Dorothy Lamour. 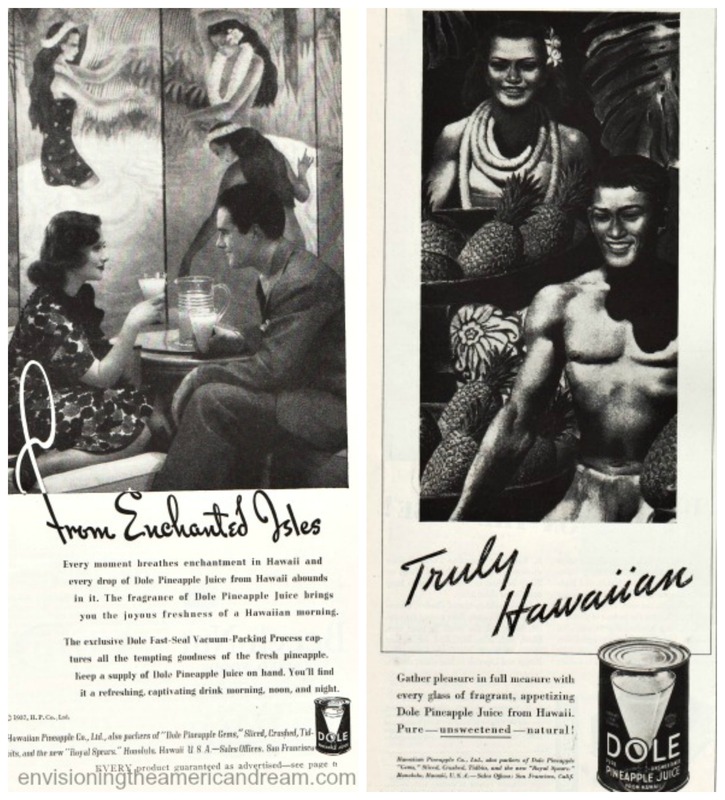 The closest most Americans would get to those enchanted Isles of Hawaii would be courtesy of Dole. Whether as canned juice or slices, exotic pineapple from Honolulu Hawaii had become immensely popular over the past decade due to its unusual health values. Pearl Harbor a once unfamiliar name for most Americans who weren’t quite sure where it was, would grow increasingly familiar all too soon. The next day, Sunday, the eastern seaboard was quiet but jittery with the news of the surprise attack. Along with millions of Americans, my mother first learned of the attack when her father turned on the big mahogany RCA Radio to hear his favorite CBS broadcast of the NY Philharmonic concert at 3pm. 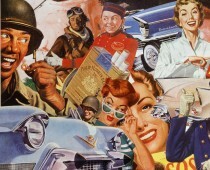 That Sunday most people gathered around their radios listening for whatever news they could get about Pearl Harbor. On anything but a mundane Monday, 60,000,000 jittery American would remember exactly where they were when they turned on their radios at noon to listen to President Roosevelt speak of that day that would live in infamy!